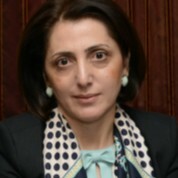 Lilit Ghazaryan is a pharmacist graduated from Yerevan State Medical University in 1991. She began her career in a regional pharmacy and in 1997 started work in the Armenian Medicines Regulatory Authority under the Ministry of Health: Scientific Centre of Drug and Medical Technology Expertise. Since 2004 she is the deputy director and responsible for coordination the activities of the marketing authorisation, pharmacovigilance and information departments. She has taken part in developing of many pharmaceutical legislative documents and participated in several national and international programs in the field of medicines regulation. Since 2011 she is also focal point with the responsibility to create and maintain Antimicrobial consumption (AMC) monitoring system in Armenia, as well as for the development and implementation of the National action plan on Antimicrobial Resistance. She is a member of AMC network and coordination team lead by Health Technologies and Pharmaceuticals programme in WHO Regional Office for Europe.